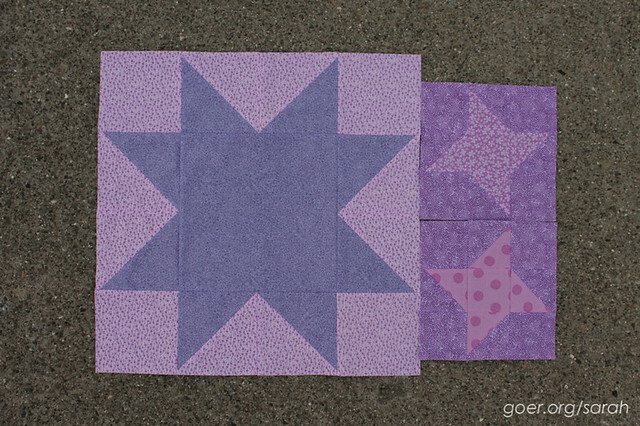 I've made progress piecing my Star Light Star Dark quilt, and I can't wait to finish up! I showed off my big stars in my last post. Here they are with my small stars. I'm holding off on showing my other fabrics in favor of the big quilt top reveal when I get it all pieced together. :-) This project has been so quick and easy. Now to start thinking about how I want to quilt it. See others' progress on Instagram. There are so many beautiful versions in progress. 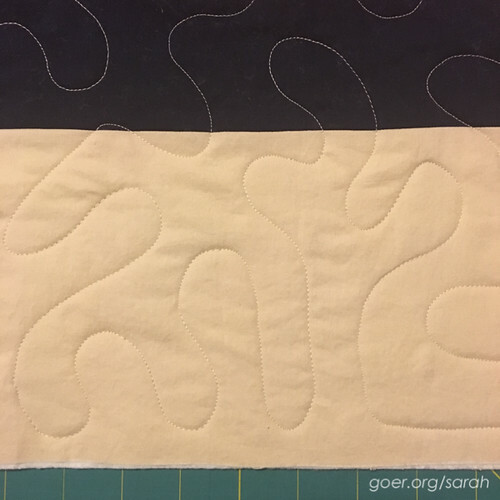 My kids continue to make slow progress on their projects, but mostly I had to help my daughter do her next two line of quilting so I'd have enough pins to baste my 58" x 83" secret project! I was out of town on a family vacation last weekend. Since it was a relaxy, hang out in the vacation house kind of trip, I finally got my act together to pack along my La Passacaglia project to start basting and piecing. I'm happy with the progress I made, but I'll have to make an effort to work on it. 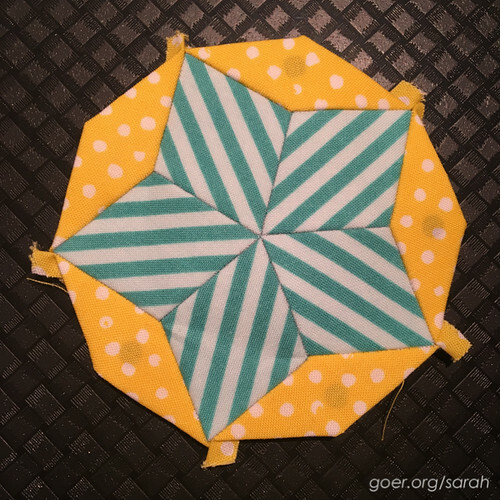 I figure by the end of the first rosette I'll know if I'm hooked for the long haul or if rosette #1 is destined to stand alone as a mini quilt or on a bag. Right now it feel like magical bonus sewing, since it was done at a time I couldn't have been machine piecing. At home, I might work on it while watching TV in the evenings with my husband, and I intend to tote it around to work on when I find myself with a few minutes waiting for school pickup time and such. Here are the first ten (of 90) pieces in rosette #1. Mostly this week, I've been working on cranking out a finish that I can't quite show off yet. Come back tomorrow for a full reveal. 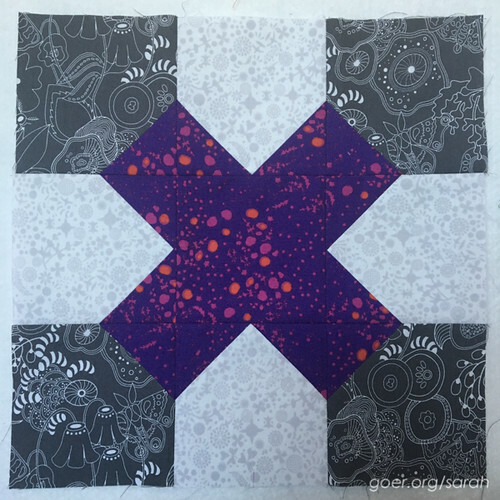 I'm linking up to Let's Bee Social, Needle and Thread Thursday, and Star Light Star Dark Progress Linkup. 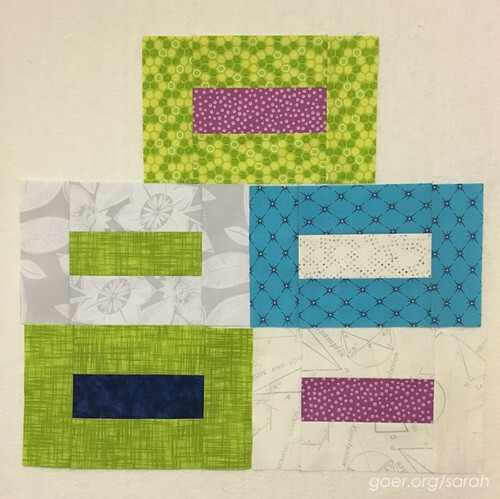 Posted in Quilting on August 17, 2016 by sarah. Lots of progress, Sarah! 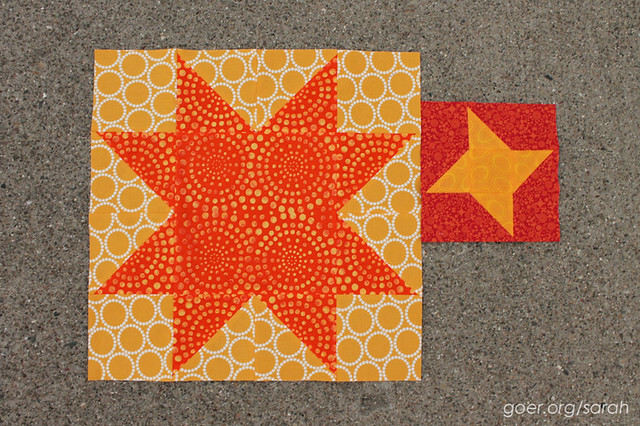 I noticed that fussy cut friendship star, well done! Thank you, Paige. I only had a small piece of that purple fabric, but I had just enough to be able to manage the fussy cutting and it was so worth it! Hi Sarah, it's nice to see some of your recent progress. 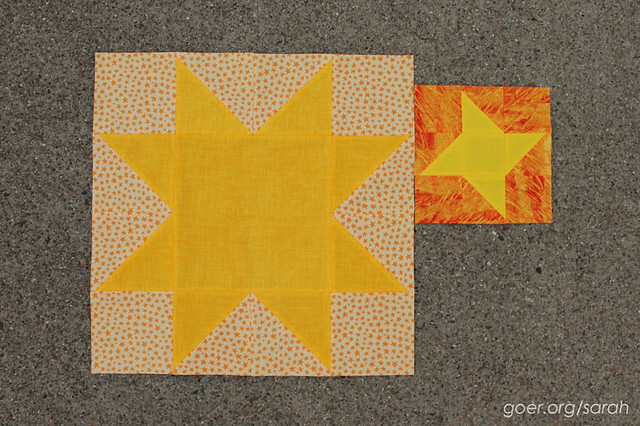 Your star blocks are looking beautiful, and I love your Tic Tac Toe bee blocks. It looks like your queen bee specified black, low volume, and purple/pink as the cross. I wish there was one place I could see all the Bee Hive blocks/posts in one place like Stash Bee. I'd love to see what other members of your swarm are doing with this block. Take care, Mary. I should have specified, she chose med-dark grey, low volume and jewel tones for the X. I love The Bee Hive hashtag on IG. And here's the link for our group, Swarm Tisha. There are a few others for this month in the feed. Thanks for visiting, Mary! You have been busy! 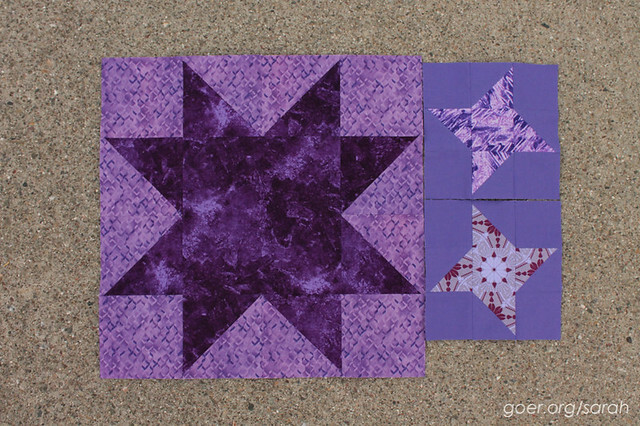 I am definitely excited to see how everyone's Star Light Star Dark quilts are coming together. And I am impressed by everyone who tackles La Passacaglia and look forward to seeing how yours progresses. That picture of your daughter basting needs a frame! So cute!! I gasped audibly when I saw your small stars. 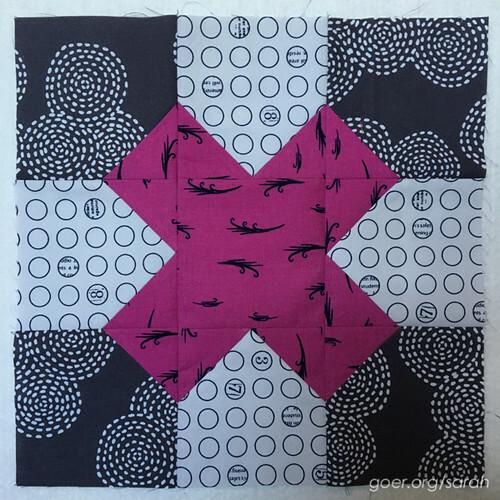 I am so excited to see your SLSD quilt (and your finish tomorrow). You've been busy as usual...I really like the Star Light, Star Dark project. I enjoy the contrasts...The Rosette design looks very interesting. Looking forward to seeing more of that in the different colors. I just love stars and yours are no exception. These have been so fun. I should make more stars! Thanks for visiting! I always love seeing kids get involved with the quilting. 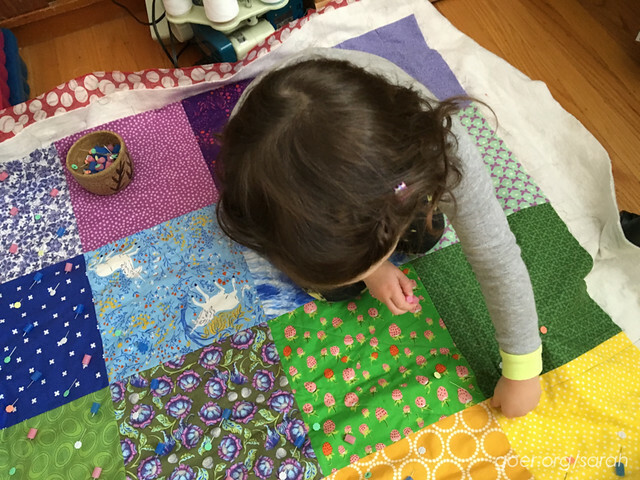 :) It is so nice to see the next generation of quilt lovers. Those blocks for your Bee are lovely! The colors are amazing. Thank you, Jen. I think one of the best parts of being in bees is working with color palettes I might not have chosen myself. These were both palettes I really enjoyed. Holy productive summers (way more productive than mine!). 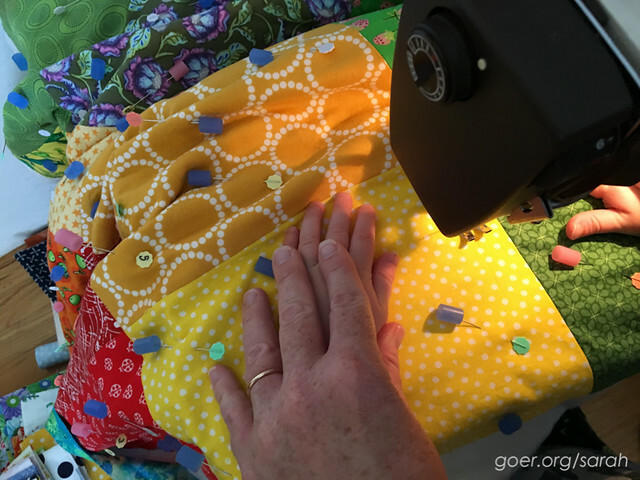 I especially appreciate the in-progress shots of your Quilty Habit quiltalong. It's such a fun design, with its oversized blocks, chunky layout, and contrasting colors. I look forward to your full reveal!